STAY OUTTA THE STREETS! Dodge the Rads! Transcend Censorship! Subscribe and Share! Divide the Labor! 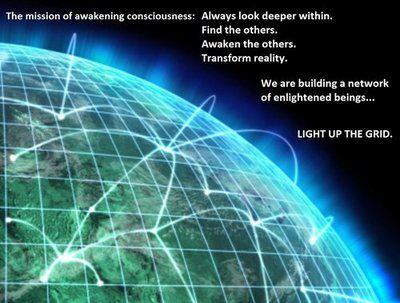 Multiply the Awareness! Million [RADS] A Week Club – YRTW 27 – Plus More US Cities – by Bob Nichols – ARE YOU IN ONE? MILLION A WEEK CLUB – YRTW 24 – Plus More Cities by Bob Nichols — This nuke stuff gets real serious, real quick….! WHAT DOES IT TAKE TO BE ELIGIBLE FOR THE MILLION A WEEK CLUB – YOUR RAD THIS WEEK IN THE US? Why Dodge the Rads? Physics too hard? Math too hard? TRY GEOGRAPHY! MILLION A WEEK CLUB NO 6 – California’s Boosted Fires by Bob Nichols | Wait. WHAT!?! LUCY OCCUPY AND FRIENDS — ARE YOU ONE? MILLION A WEEK CLUB – The Bad Stuff – No 3 – Facing a Dying Nation – WHERE’S THE BETA!!? Remember Remember NOVEMBER is Nuclear Awareness Month — Hey! Whatcha Gonna Do to Dodge The Rads !?! TOTAL GAMMA RADIATION in Your Radiation This Week – So What? Here’s What! WELL WELL — Yes – Is This Tech Support? We may have a situation…. Trump Orders VT Eliminated?!? THE RAD IN AMERICA — DID YOU BOOKMARK AND SHARE THESE LATELY? WE ARE THE MEDIA NOW! Gamma Radiation Report: YRTW SOL 5 and 6 – Mapped! Facing a Dying Nation! Short and to the point, the Sievert measurement informs all residents of imminent danger. Very democratic, that. New York City more Radioactive than Tokyo Japan – Psst— What’s Next!?! Keep it simple! GOT VIDEO? YRTW SOL 1 and 2: Gamma Radiation Report | Dodge the Rads! Evacuation and Extinction – we need to talk about this!!! Continue to Dodge the Rads and Read More than Headlines! Remember Remember the 5th of November #YRTW Notice! Your Radiation This Week No 77 and 78 – and about the Plutonium…. Did you see Your Radiation This Week Play List on YouTube? Watch and Continue to Dodge The Rads! POISONED AIR FOR ALL – Plutonium Air and Time Lapse Map of Every Nuclear Explosion Since When? UNDECLARED NUCLEAR WAR CONTINUES…. WHAT BLOCKHEADS! TAKE THE POLL WHILE THE PERPS TAKE THE 5TH? Your Radiation This Week 65 and 66 – What to do about the nuclear industry perps?! Your Radiation This Week No 54 !!! NO WAY ! ? ! Your Radiation This Week – Shared by Leuren Moret! Who else? Be Alarmed and Be Alarming! Your Radiation This Week No 53! FUKUSHIMA! ONE THOUSAND EIGHT HUNDRED TWENTY EIGHT DAYS! DO YOU UNDERSTAND? Your Radiation This Week No 42 -Boost That Post? Yeah, Sure Thing FB Thought Police! YOU KNOW WHAT? Ask About YOUR RADIATION THIS WEEK No 26 ! Did you READ: Your Radiation This Week No 25? 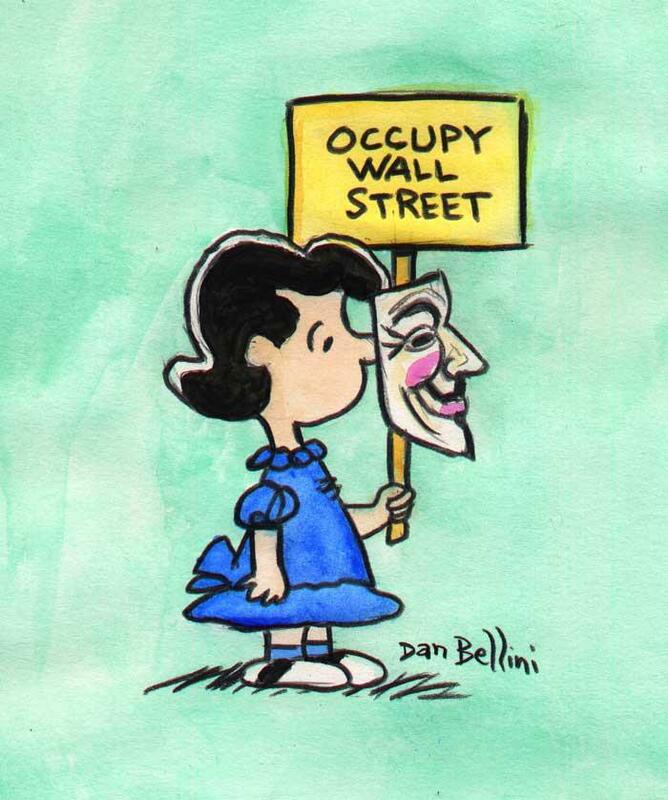 Lucy Occupy and Friends – Think Locally * Act Globally #OccupyVirtually YOU KNOW WHY. Do you still subscribe? Lucy Occupy Says ENOUGH IS ENOUGH….or… IS MORE BETTER? Your Radiation This Week – on YouTube – with Strontium-90! See and Share! Thanks! YRTW: “Can 1,000 CPM be far behind?” WILL THEY JUST RAISE THE STANDARD TO 1,500 CPM? Your Radiation This Week No 15 – What Precautions did YOU Take? What would R2-D2 and C3P0 Do? What did you learn about YOUR RADIATION LAST WEEK #12? Did you see and share No. 10? What did you learn about YOUR RADIATION THIS WEEK? “Your #Radiation This Week #8” “No Immediate Danger” Still the Industry Chants? Is Captain Heather Cole a Global Hero or a Propaganda Pawn? #WignerEffect? Physicists will get it— Worldwide! Profits before Lives by the Genocide Gangs…. ASK AT THE UN AGAIN, HUH? “WE ARE THE MEDIA NOW” LUCY OCCUPY SAID…..
Rosa Parks of #WorkComp? Whaaaat??!!! Is it true you are no longer doing #WorkComp? #Fukushima? #Nuclear? #Radiation? #Santa? #WorkComp? #ELE! What’s next? WHO WILL RALLY TO THE RESCUE OF THIS AND OTHER INJURED WORKERS IN AMERICA?? That #WorkComp insurance blockhead said what to whom?? #WorkComp? YOU BLOCKHEADS!!! Americans Maiming and Killing Injured Americans FOR PROFITS! 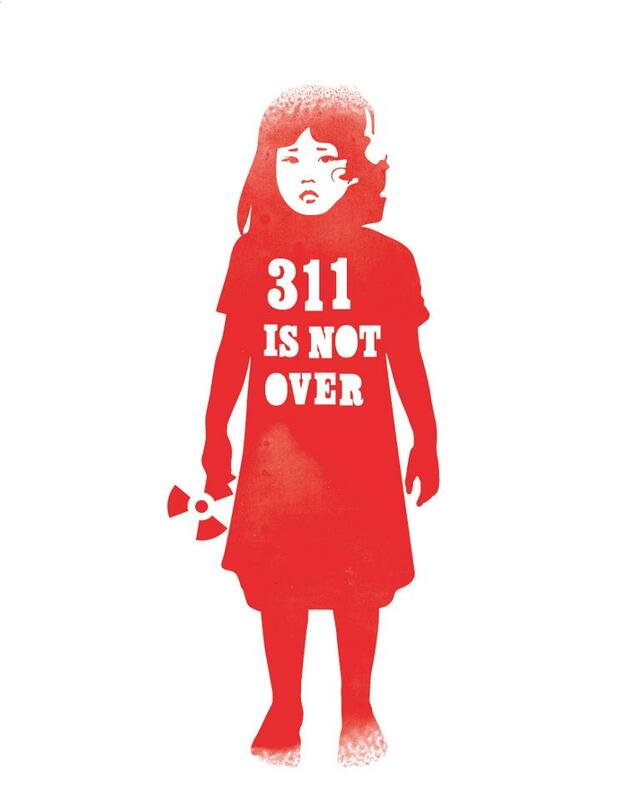 #Fukushima #FukU #ThreeElevenEleven #Nuclear #ELE … Did you…. #FukUShima #Radiation: HERE THEY GO AGAIN WITH THE BANANA STUFF! D’oh! ProNukers? Psychopaths? Mules? Stupids? Just following orders, or Just WHAT! #Fukushima #Nuclear and Aliens?? D’oh!!! Grey Befuddled Perplexed Baffled Mysterious Psychopath PSY-OP ALERTS??!!! FukUShima: Plaid Skies and Global Warming vs. Radiation Poisoning?! Something BIG and #Nuclear has Happened AGAIN!!! Who knows more??!! Have you personally watched the #Fukushima “pools” 2, 3 and 4 ….. Phooey! Show Evidence! PHUKUSHIMA USA FOIA ALERTS and Significant Research!! Ain’t no #Nuclear Accident! Did you know about the Water, too??!! 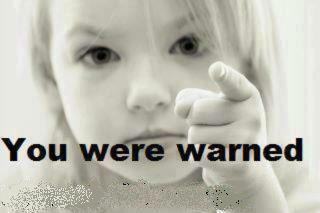 Lucy Occupy Said: #Fukushima #Nuker Alert! There’s light at the end of the tunnel. Looks like that NGT #311! Lucy Said to the Galactic Crowd….. Yo! Wake Up! ASK MORE QUESTIONS: Every Movement Needs a FLOWER / Symbol / Brand !!! Ask About ____ Now ! Lucy Asks ….. Really, This was all done for the maniacal pursuit of Profit … at any Cost? Who ok’d this??! Lucy Says: “It’s all perspective, isn’t it?” #SONGS or #Fukushima, Jobs or No Jobs, Nuke or PRISM, HAARP or JASON … endless perspectives . . .
Stay OuttaTheStreets !! You HAVE been poisoned. #FukuMonSantoShima D’oh! Lucy Occupy Says: ANYBODY OUT THERE?? It’s an ELE!! Humanity has made it to the ENDANGERED SPECIES LIST!!! Lucy Occupy Says: ELE!?? Nuclear Planetary Sterilization???!!! No Exceptions?!! Lucy’s Surprise Birthday Event…. We are the Media Now. So Be It. fb friend: that 3.5 minutes is so stupid…….so here’s a bunny with a waffle on its head! WAS IT…????!!!! #Fukushima! Crackpots at best and simply ‘nucking futs’ at worst! Strategy is the #nuclear question today. Any thoughts? Gassed. Aghast??!!! ELEmentary [Survival] Strategies and Tactics! Wake up Charlie Occupy!! The big US De-Populator is ready to fire!! #SanOnofre #FukushimaUSA! D’oh! Mic Check: Is it Wrong To Want One of These??!! Who loves you ?!! Fukushima! 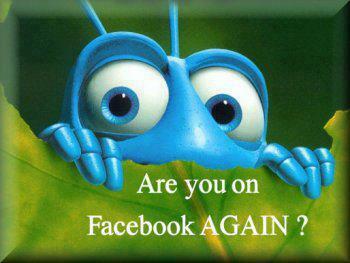 January+ 2012 AAFN blogs….. Did you read and share them yet?! Whaddya Think Now? Lucy Says… “We are the 94%!” Tweet, Blog, Post, Share, Digg, Stumble ETC. We ARE The Media Now…. Now what? Lucy Occupy Says….. What a Fukushima Year! Here are some of the photos! Did you see them all? 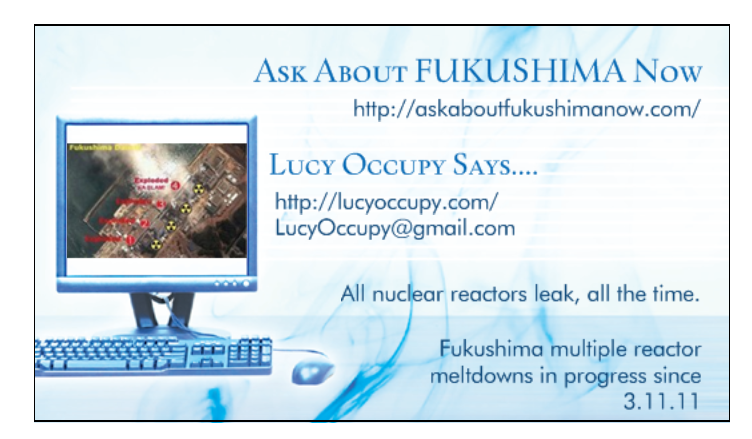 Lucy Occupy Says: Nearly 40,000 blog direct views 1st year: ASK ABOUT FUKUSHIMA NOW….. WE did it! WE ARE THE MEDIA NOW…. Lucy Occupy says, ‘Cows???!!! Fukushima? ?’ “What are efforts to contain Fukushima?” Read all about it! THINK LOCALLY * ACT GLOBALLY #OccupyVirtually —> BE GEEKY!